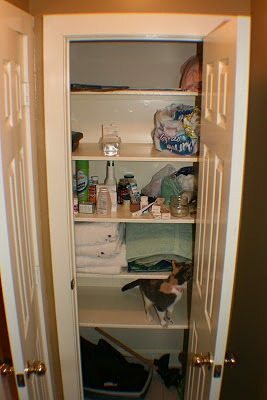 This half-bath closet is setup in such a way that it creates an access conundrum. 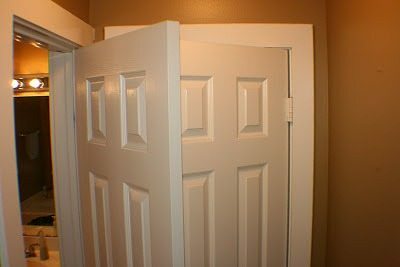 You have to open and shut the entry door before you can open the bathroom closet door. It doesn’t make access easy. Because of the awkward access, the organization has fallen to the wayside. It’s tough to find motivation and inspiration if it isn’t being used. Having a key hidden on the outside of the house is very convenient. 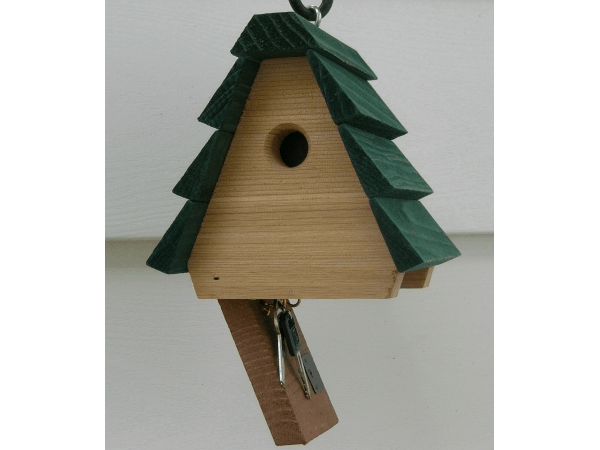 You never know when you’ll lose the one in your pocket or a situation arises where a friend needs to access the house. 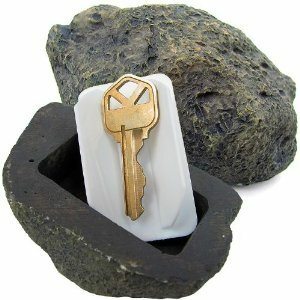 The problem is burglars are well aware of the fact most homeowners hide keys under a mat or fake rock. Today’s project is a simple way to take the rock idea to the next level. To start this project find a small container (e.g. old prescription bottle), a rock larger than the top of the container, dark spray paint (e.g. gray or black) and heavy duty water-proof adhesive. Spray paint the outside of the bottle. Glue the rock to the top of the bottle and let it dry. Find a spot in the landscaping to place the container and dig a small hole. It is best if it is next to some other small rocks. If needed, you can put a small dot on the rock to help you decipher the container from the other rocks. Be careful about using this trick in colder climates. Snow can make it very difficult to find such a small object! There is no shortage of solutions on how to hide your keys. The ideas range all the way from fake rocks to fake birdhouses. The best solution is keyless entry. Then there is no need to fret over the possibility of someone finding the secret hiding spot. Keyless entry is generally available for two places: the garage door and front door. A key pad usually comes along a garage door opener and is a decently convenient method. A front door keypad is nicer but can be a bit unsightly. Either way, make sure to only give access to people you trust and don’t set the pin number to the address of the house! A great space for storing cleaners, bags, and rags is under sink in the kitchen. The problem is the space seems to get cluttered very fast. A little organization can go a long way towards increasing usable space and make it easier to find items. First of all, Happy New Year! All of us at HomeSpot hope you had a great 2012 and thank you for allowing us to help you manage your home. If you have any feedback on our home maintenance tracking tool, please feel free to contact us. We are always looking to improve our software to better help you. Already made your personal New Year’s resolution? How about adding a second one for your home? In 2012 I made the resolution of trying to take much better care of my home with the hopes of reducing the number of required repairs. For the most part everything went to plan (i.e. one garage door repair). The previous year I had repair costs for the air conditioner, garbage disposal, water softener, and two toilets. I also saved a couple hundred dollars from fewer service calls by doing a good share of maintenance myself. Cleaning the furnace and water heater for the fall maintenance checklist saved around $200. During the spring the coil cleaning cost me about $10 in materials and an hour instead of the $100 service call. For 2013 I’ve decided to set my goal on reducing clutter around the house. I figure having everything sorted and organized around the house will help make it easier to manage all the rest of the chaos that comes with maintenance and projects. Plus, it will be a good opportunity to give back by donating to Good Will or the Salvation Army. One way I plan to declutter is in the closet. 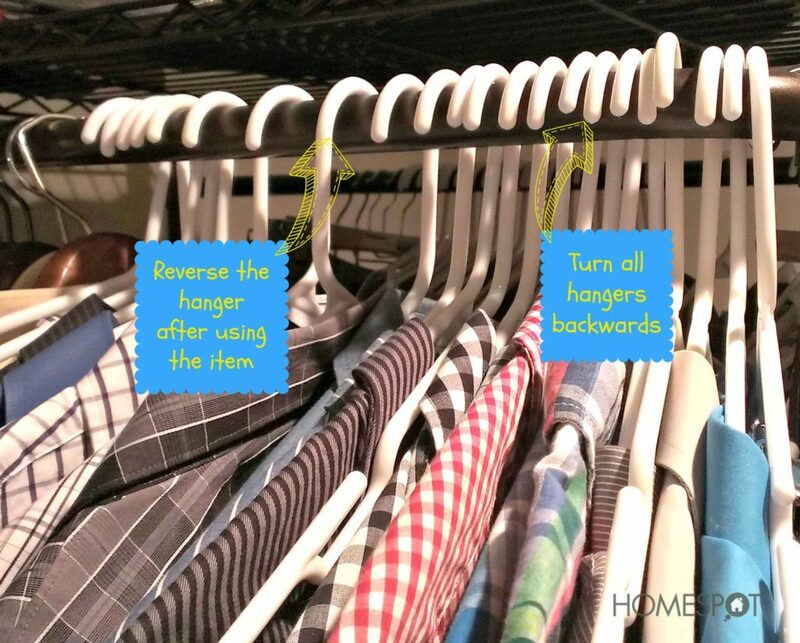 All of the clothes on hangers have switched backwards so that the hook is facing outwards instead of inwards. As items are used and placed back, I turn the hangers back to normal. Towards the end of 2013 I will take a look at which hangers are still facing outwards and donate those items. With the new year kicking off, one typical task for keeping your home organized is starting or refreshing a filing system for documents, papers, bills and other items around your home. Here are a few tips to help you get started with a filing system that actually works all year long. 1. Invest in a good file cabinet. If you want your filing system to succeed, you can’t spend the year fighting against it because it lives in a sticky or undersized drawer. 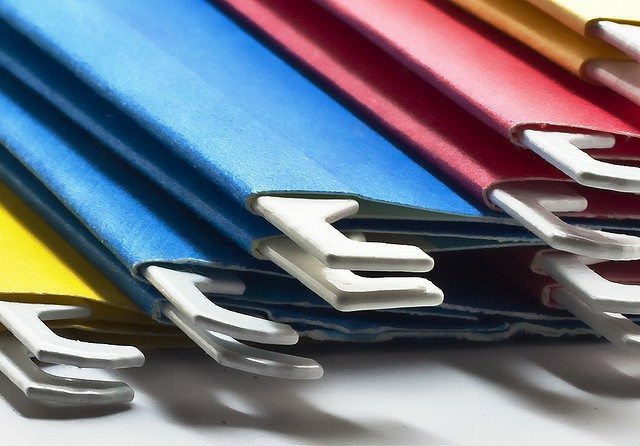 Invest in a good file cabinet that allows you to use hanging files. Craigslist is a great place to start since you’ll find dozens of sizes, shapes and colors to choose from at decent prices. Expect to pay $30-$100 for a good quality metal cabinet that is sturdy. 2. Get a label maker. Label makers are the bread and butter of the highly organized. When you use a printed label instead of handwriting to mark your files, they are quicker to find and easier to sort. You don’t have to go overboard, but something like the Dymo LabelManager 220P Portable Label Maker should serve you well for the long haul.